Located next to the Typhoon Lagoon Water Park and near Hospitality House, Disney's ​Old Key West Resort offers a beautiful sandcastle complete with a 125-foot-long waterslide through its lush interior and into a 149,600-gallon pool. The entire area of the resort is meant to harken to the casual, laid-back attitude of the Florida Keys. With colorful images of dolphins and other marine wildlife adorning the sides of the family area, parents can relax while their children play at the kiddie pool. Alternatively, guests can unwind in the whirlpool spa or dry sauna in the pool deck's lighthouse. Like all pools at Disney World Resorts, hours and lifeguard availability vary by location and are subject to change depending on the season and weather. Towels are additionally provided at each pool and should be returned to their proper receptacles after use. The water slide at the carnival-themed pool at Disney's BoardWalk Inn, known as the Keister Coaster, resembles a roller coaster with a slide that emerges from a giant clown's mouth. The Boardwalk Inn section of the World Resort is full of clowns, so if your child is afraid of them, this isn't the right accommodation for your family. Still, if your children are fans of clowns, the Keister Coaster is located at the south end of the main pool and features a 200-foot waterslide that has been in operation for over 40 years. Additional features of BoardWalk Inn include watercraft and bike rentals, tennis, hiking trails, arcades, exercise rooms, and several other pools not attached to the Keister Coaster waterslide. The lushly landscaped swimming pool at Disney's Animal Kingdom Lodge also has a zero-entry feature and a water slide that stretches 128 feet down and into a 118,138-gallon pool that's perfect for cooling off after a trip on safari in the Animal Kingdom. A nearby bar and lounge offer refreshments and snacks for parents and children alike, and parents can even get away for a moment while their children enjoy the Uwanja Camp, a water playground complete with three distinct zones for kids of all ages. Observation Station is meant for children younger than 4 while Departure Zone is for kids aged 5 to 7 and Base Camp is designed for children 8 years old and over. Each of these zones is also within sight of a bar and refreshment stand, so you never have to fear to leave your child alone while you get drinks and snacks. Disney's Yacht Club and Disney's Beach Club resorts share one of the best water slides in the Disney World resort, with the shipwreck slide at Stormalong Bay standing out as one of Disney's most iconic waterpark attractions. Here, you and your family can explore a life-size shipwreck where you can climb the mast and slide down one of the World Resort's highest hotel waterslides or cruise down the Lazy River in an inner tube. 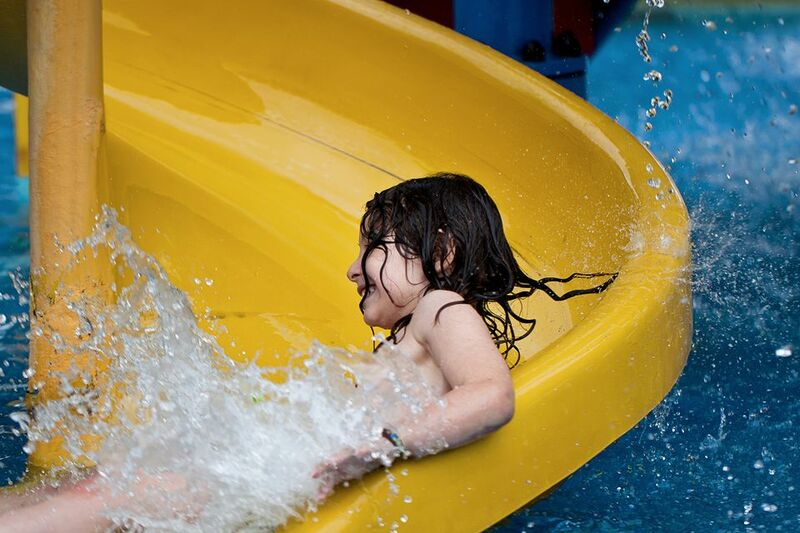 This resort also features three whirlpool spas, an elevated tanning deck, two kiddie pools (one with a miniature water slide), and three quiet pools as well as restaurants and activities that are fun for the whole family. If you're looking for a Disney adventure on the high seas, the Yacht Club is your area of the resort! The moderately priced Disney's Coronado Springs Resort is home to the five-story Mayan pyramid water slide shown here. Guests can relive the days of the Mayan Empire at this awesome waterpark resort built around a 50-foot replica of a Mayan pyramid. Explore the Lost City of Cibola pool or take the even higher Jaguar Slide before stopping in for a taste of Mexico at the Maya Grill or working out at the La Vida Health Club. Coronado Springs Resort pool, also known as the Dig Site Pool, is home to the largest outdoor hot tub at the World Resort with enough room to accommodate up to 22 people at once. In addition to the larger water slides, a few of the Disney World resorts have smaller versions for the younger children, and this slide pictured above at Disney's Saratoga Springs Resort and Spa is just the right height for the little guys. Stormalong Bay at Disney's Yacht and Beach Club Resorts also has a junior version of the larger water slide, and most of the other areas of Disney World Resort feature something for smaller children to do, but the Kiddie ​Waterslide is by far the best option for children under the age of 10. One of the most thrilling waterslides at Disney World isn't at any of the resorts but can be found at Disney's Blizzard Beach waterpark instead. Here, the Summit Plummet sends sliders almost straight down at 55 miles per hour! Disney's Blizzard Beach is designed around the concept of a former ski resort that has started to melt, transforming the once-icy slopes into waterslides and water sledding courses that make up the waterpark. Blizzard Beach also features the slushy slopes of the park's Mount Gushmore, a tranquil river float, a white-sand beach, and one-acre wave pool.